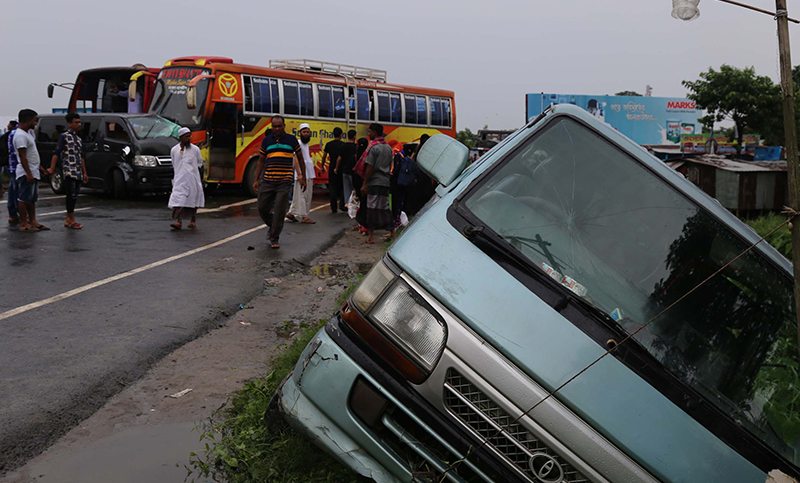 One person was killed and 11 others were seriously injured in a road crash at Amirabad area in Daudkandi upazila of Cumilla on Dhaka-Chattogram highway around 1 pm on Tuesday. The deceased was identified as Jewel Kumar Prodhan, a Bangladesh Jatiyatabadi Chhatra Dal activist. The in-charge of Gouripur Police outpost Sub-Inspector (SI) Abdun Nur said the accident took place while a microbus and two motorcycles of a motorcade of BNP standing committee member and former minister Dr. Khandaker Mosharraf Hossain were hit by a Dhaka-bound passenger bus. Mosharraf, who was going to attend a wedding programme at Muhammadpur area of the upazila, was unhurt. The SI said eight among the injured were admitted to Dhaka Medical Collage Hospital and the three others were in local hospital.